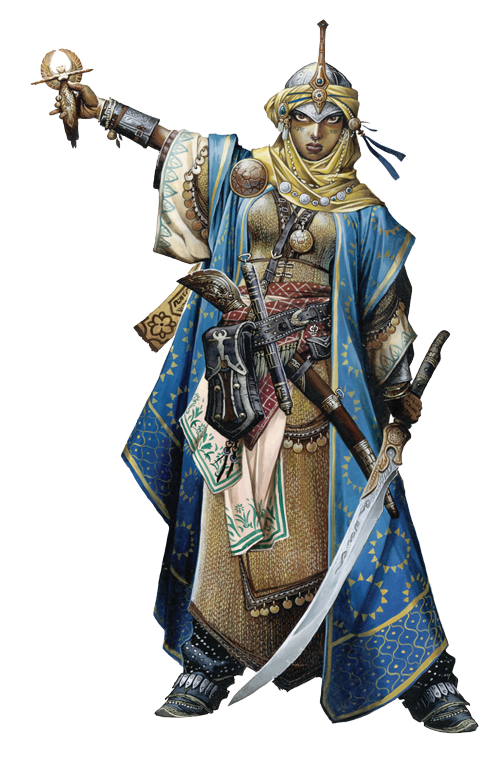 Kyra grew up near a small temple to the sun goddess Sarenrae, and when bandits attacked her village, the priestesses gave their lives defending the innocent. Standing in the burned ruin of the temple, young Kyra swore her life and sword arm to the goddess, promising mercy to the deserving and a quick death to those who glory in murder. Before Combat Kyra casts divine favor and shield of faith before the start of the encounter. During Combat Kyra focuses her attacks on any creatures that are innately and irredeemably evil—such as evil outsiders and undead—while offering a chance of redemption to those who can still be turned to good, and healing her allies as needed. Without divine favor and shield of faith, Kyra's statistics are AC 23, touch 13, flat-footed 22; Melee +2 flaming scimitar +14/+9 (1d6+5/18–20 plus 1d6 fire); Ranged mwk sling +11/+6 (1d4+3); CMD 25. Kyra was one of the few survivors of a brutal raid on her hometown, and on the smoking ruins of her village she swore her life and sword arm to Sarenrae, the goddess of the sun, redemption, honesty, and healing. Possessed of a fierce will, pride in her faith, and skill with the scimitar, Kyra has traveled far since then. Where another might be consumed by anger and a thirst for revenge, she has instead found peace in the Dawnflower, and in the belief that if she can prevent even one death at evil hands, her own losses will not have been in vain. While she takes great pleasure in ridding the world of evildoers, she takes even greater pleasure in redeeming them.